Does this car look familiar? It is our 1907 Reo before Dad bought her and brought her home to the Museum. This picture was sent by Serena Edmunds, great granddaughter of George Grey Senior, the original owner who walked from Bury Quebec to Nashua New Hampshire to buy it new in 1907. 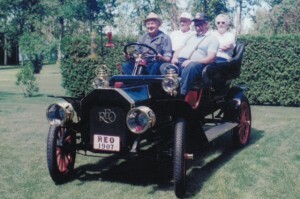 The REO touring car was also the first car down the main Street of Sherbrooke Quebec! Seated in the car are her uncle George Grey Jr., from whom we purchased the car, and his brothers and sister.